Bezalel Books — A sweet introduction to priestly vocations for young boys and their families. Through charming text and illustrations, Where Do Priests Come From? answers questions that help to make the man behind the collar real and relatable to young and old. How do young men become priests? What do priests do? Where do they live? Do they have hobbies? A beautiful story your family will treasure. Testimonials for Where Do Priests Come From? A lovely little book explaining a most profound mystery – the priesthood. I pray this book finds its way into the hands of many young boys so that they can be inspired to ponder the question: “Is God calling me to be a priest? A book I can give to my own nieces and nephews on the priesthood. I plan to read it to them myself. Where Do Priests Come From? is a great book! It’s a beautiful and inspiring story for today’s Catholic children. The illustrations express the faith, which the book shares and highlights. I would strongly recommend this book to Catholic families, schools, and formation programs. I truly wish I had this book when my sons were younger, so my copy will make the rounds at my local Catholic school. Then, it’ll be going to our diocesan vocations director. I am thrilled to see that they have planned more books for this series, Where do Sisters Come From? and Where Do Deacons Come From?. What a wonderful tool for parents and teachers to introduce the Catholic faith to young learners. 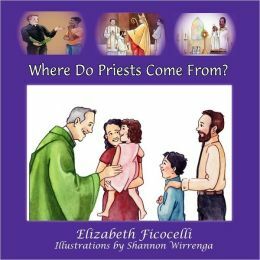 Elizabeth Ficocelli’s words and Shannon Wirrenga’s illustrations go together like hand in glove to give children a rich, human, catechetically-sound introduction to the lives of our priests. I also take my hat off at the way Ficocelli was able to weave fifteen kid-friendly definitions into thirteen pages! Now besides being a dad, I’m an educator; and that feat earns her an “A” in my grade book. There’s even a glossary! In my work as Vocation Director, I frequently have questions about resources for young families to help introduce the idea of a priestly vocation among their sons. I finally have that resource in this little book. It is written in a very charming style, walking with a priest through his time in formation and showing the balance in that he is still a real person, called to do something great. Elizabeth answers the title question with simple explanations, when taken with the illustrations, tell the story of the discernment of a vocation in a gentle, accessible way. Purchase Where Do Priests Come From?